Despite a PC release here and there, TMNT games were for the most part associated with Nintendo consoles due to the main entries in the series being released on the NES and SNES and the high quality and popularity of those games. 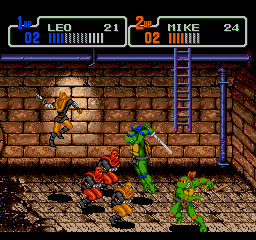 Sega had never been graced with any games starring the heroes in the half shell, rather having to compete with their own line of beat-em-up games in the Streets of Rage series. By spring of 1992, Capcom had began to expand their outlet on Sega’s Genesis system due to its stable footing on the American market, and it was probably not a coincidence that Konami followed suit quickly thereafter. 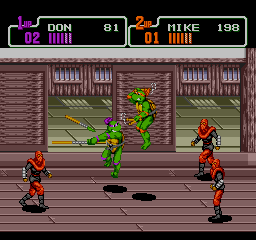 In August of 1992, the first TMNT game for a Sega console was released. Making use of another young team in-house at Konami led under Hiromi Sumida, Hyperstone Heist is best described as a remix game, making use of objects and properties made for the previous games, though retooled slightly to fit the new story. Taking the general premise of Manhattan Project, Hyperstone Heist sees Shredder shrinking down Manhattan into collectible size with the use of the Hyperstone, a highly rare and potentially dangerous stone from Dimension X. In what has by now become a weekly broadcast on American airwaves, Shredder issues a challenge to the turtles to stop him. 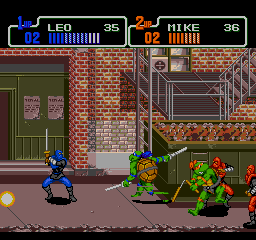 The levels are all taken from The Arcade Game and Turtles in Time, with minor touchups to make them flow together properly. In addition there are also a few all new sections. 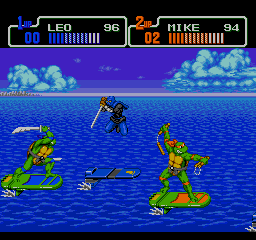 The sprites and controls are lifted from Turtles in Time, playing identical to that game with the exception of one things. The Mode 7 powered screen toss is missing entirely due to the Genesis not being able to scale and zoom sprites in a similar manner. The color palette is more restricted, though this in turn allows for a grittier and tougher look to both the Ninja Turtles and their adversaries. The cutscenes feature some slightly redesigned looks to both the four turtles and Shredder, who is probably looking his best ever in this game. Even though most stages are more or less identical at first glance to those found in the two arcade outings, the length is greatly increased per stage and several sections added along with an all new enemy pattern. 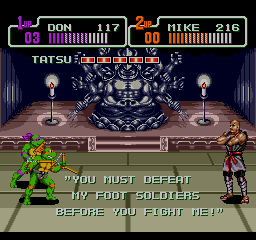 The general enemy selection remains fairly similar as before, though the boss gallery has some peculiar choices, not in who you fight, but rather who you don’t fight as Rocksteady is on his own with Bebop not to be found anywhere in the game. Hyperstone Heist is noteable however for being the only console game where Tatsu from the live action movies appears as a boss. Both the bosses and the regular enemies have a boost in their AI, making for a more challenging and perhaps more satisfying brawler. 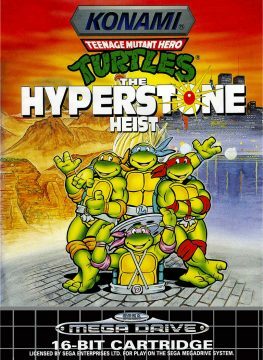 Even though most gamers had by this time come to expect and accept the Genesis sound chip to being utilized in mostly inferior ways and not on par with the great sound of the SNES in comparison, Hyperstone Heist really kicks up the quality in the sound department, not only bringing over fan favorites from both Turtles in Time and The Arcade Game, but also composing all new songs for several of the new sections. The Shredder’s Hideout stages in particular, feature quite incredible melodies that easily hang with the best of the SNES tracks. The voice clips however are the opposite and are extremely low quality. 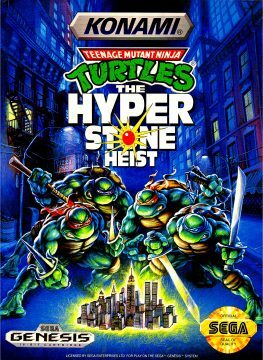 Hyperstone Heist is in ways a perfectly acceptable entry in the TMNT franchise of video games, and Sega loyalists were happy with the results though it didn’t completely fill the void that they endured over several years. 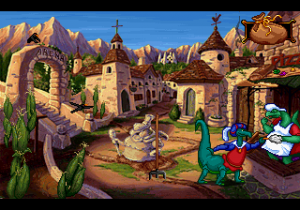 On the plus side, the animations, sound and controls are probably at their best yet, with the overall pace and difficulty of the game being much more enjoyable here than what it was on either SNES or the NES. Another strike against the lack of creativity in the Turtles in Time stages are that the sections brought over from that game have not been changed much at all, and still do not stick out despite being set billions of years in the past originally. The major hurdles for Hyperstone Heist are its shorter length and weaker color schemes on the backgrounds which makes some of the stages look a bit flat. It’s a fine compliment to the games which it takes its origins from, but not quite on par being three games squished into one yet shorter than all three individually.